Hypothesis: We predict that the water will merge if the hot is on the bottom and the cold is on the top. We think this because cold air is more dense so it travels down and according to that information we think that it would be the same with water. Put three drops of blue food coloring into two bottles. Put three drops of yellow food coloring into two bottles. 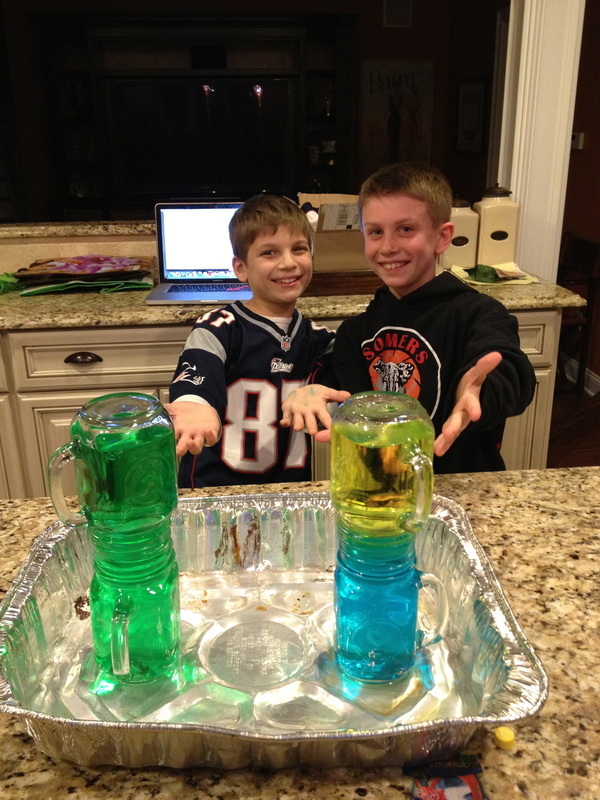 Fill the two bottles with blue food coloring to the brim with cold water. Fill the two bottles with yellow food coloring to the brim with hot water. Put one blue bottle and one yellow bottle into a pan to minimize spills. Place playing cards onto the brims of the bottles that are not in the pan. Carefully place the yellow bottle on top of the blue and the blue bottle on top of the yellow. Density of cold and warm water and air. Michael is a fifth grader in Ms.Vita's class. His favorite sport is basketball. Michael enjoys language arts, math and science. Ethan is a fifth grader in Mrs. King's class. Ethan's favorite sport is also basketball. He and Michael have been friends since kindergarten. Ethan enjoys math and science.